“Cylindrical Opuntia”, referring to the cylindrical shape of the stems in this genus, in contrast to Platyopuntia, or Opuntia, whose stems, or articles, are flattened. A genus of much-branched, shrubby or treelike plants, of indeterminate growth. Stems and segments cylindrical or clavate, often and easily becoming loose, mostly tuberculate and of various length. Areoles with glochids. Spines of variable length, enclosed in a papery sheath soon falling. subglobose, sometimes davate, sometimes proliferating and forming a chain. Seeds rather large, flattened, suborbicular, straw-coloured, sometimes absent in fruits. 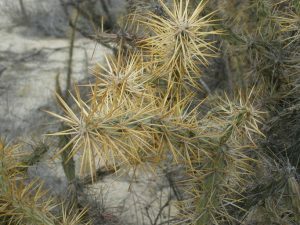 The genus Cylindropuntia is part of a plant community including several other cacti and succulents, and grows in a variety of habitats, sometimes forming densely populated colonies, among bushes and shrubs, on gravelly, sandy, sedimentary or volcanic soils, in mountainous or desert region, rocky escarpments, in valleys and arid outwash plains, on plateaus and hill slopes, in arroyos, drainage basins and depressions, on sandbars and gravel, from sea level up to 2100 min altitude, sometimes in regions covered with snow in winter (Colorado plateau), but also according to species, tropical dry scrub near the coast (Carribbean islands). Some species easily hybridize in nature. The Antilles, Cuba, Haiti, Mexico (Aguascalientes, Baja California, Chihuahua, Coahuila, Colima, Durango, Guanajuato, Hidalgo, Mexico City DF, Michoacan, Nuevo Leon, Puebla, Queretaro, San Luis Potosi, Sinaloa, Sonora, Tamaulipas, Tlaxcala, Zacatecas…), Dominican Republic, Trinidad and Tobago, USA (Arizona, California, Colorado, Kansas, Nevada, New Mexico, Oklahoma, Texas, Utah), Venezuela. Note that Cylindropuntia tunicata is naturalized in Argentina, in Bolivia, in Chile, in Ecuador and in Peru, as well as C. rosea, where we can find it in Peru up to 3300 m in altitude.